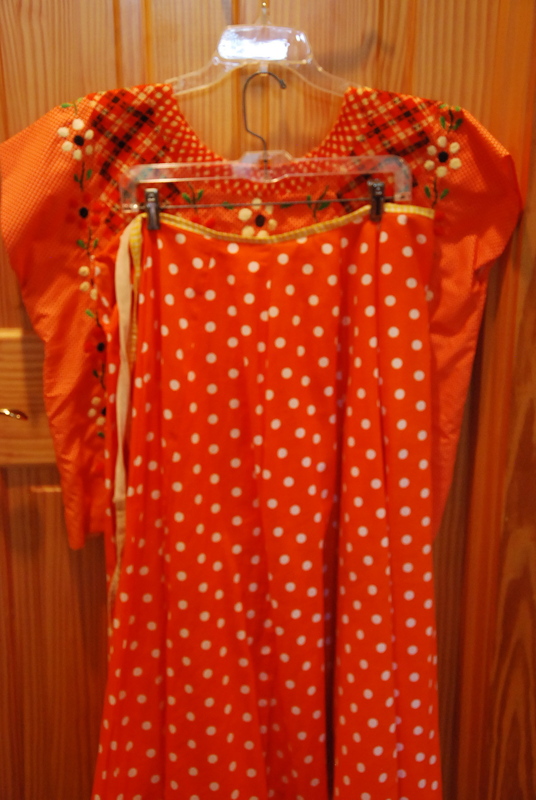 Outfit #1: Orange Polka Dots. The top is hand and machine embroidered on a tiny polka dot background. 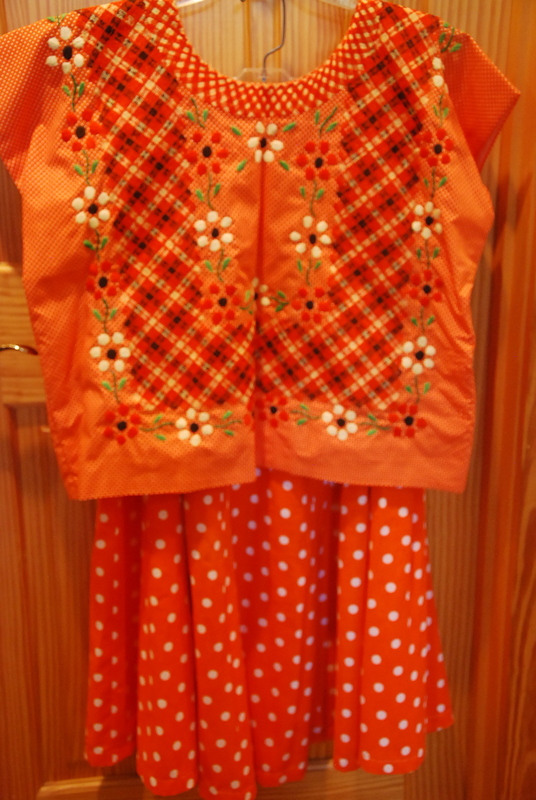 The skirt is a contrasting large polka dot design. Very fun. The gored flowing skirt is 33″ long and the waistband is 36″ around but can wrap smaller with the long ties — very adjustable. 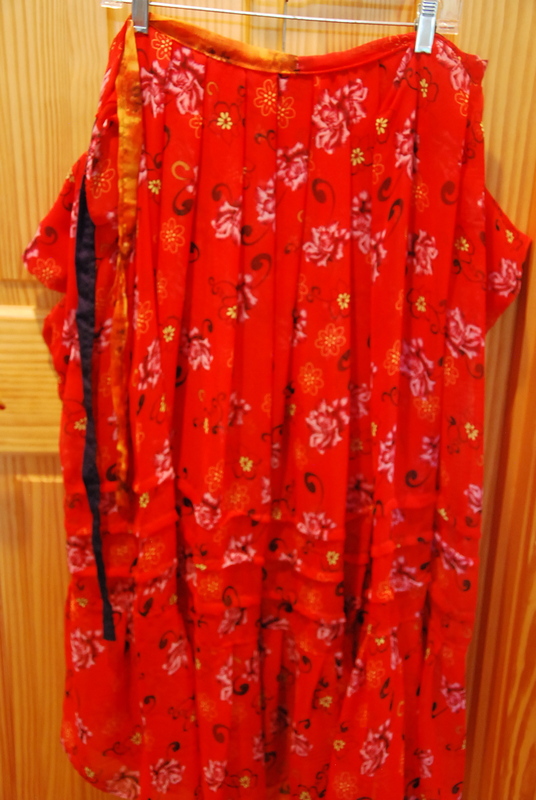 The top is lined and is 22″ long from the shoulder seam and 24″ across side seam to side seam. The fabric feels like cotton or a cotton and poly blend. $125USD. 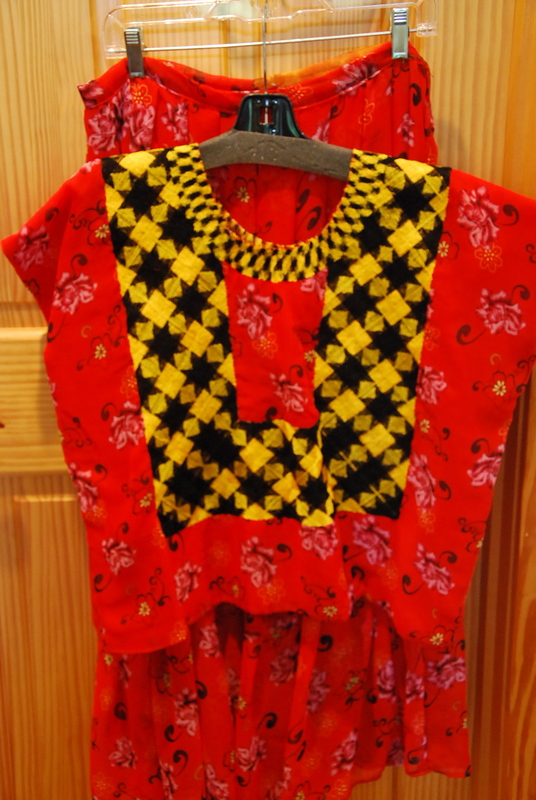 Outfit #2: Red Floral with Black Stars and Yellow Bodice. Flowing skirt is sheer poly-silk fabric, 37″ long with an adjustable 36″ tie waistband as described in skirt #1. 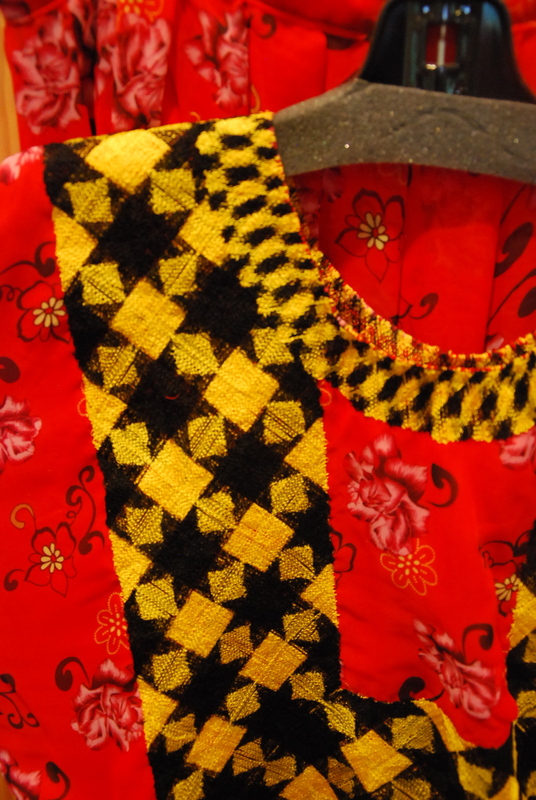 Top is lined and is 22″ long and 24″ wide from side seam to side seam. A very dressy outfit. $125 USD. 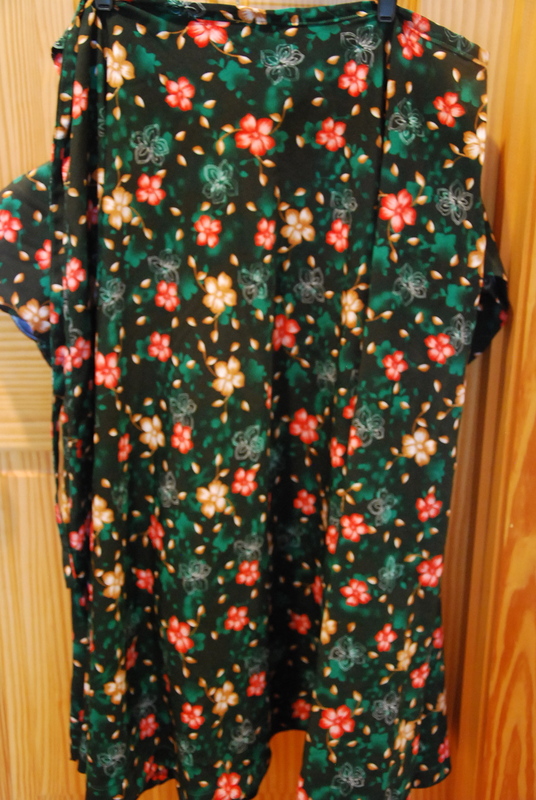 Outfit #3: Green Floral with Tan and White Embroidered Bodice. Flowing skirt is 37′ long with 36″ adjustable tie waistband. 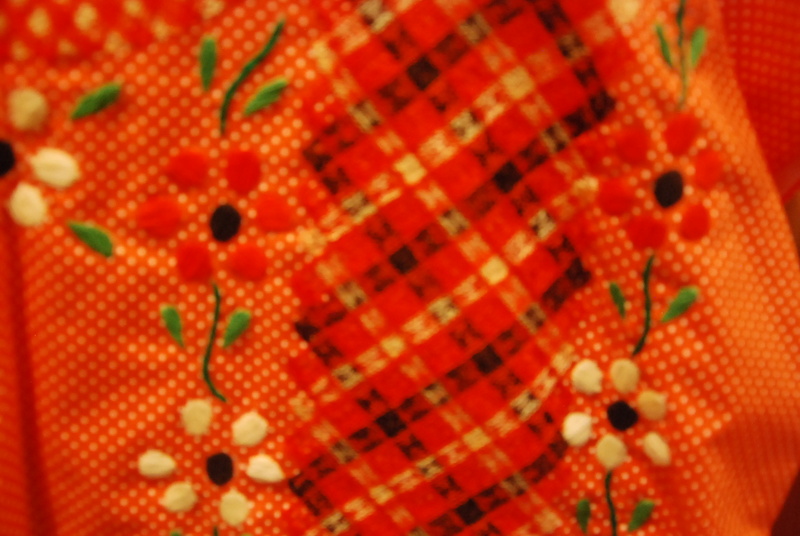 Top is lined and is 22″ long and 24″ wide from seam to seam. $125 USD. This entry was posted in Clothing Design, Cultural Commentary, Oaxaca Mexico art and culture, Textiles, Tapestries & Weaving and tagged Huipil for sale, Isthmus of Tehuantepec, Juchitan dresses for sale, Mexican textiles, Oaxaca clothing, Oaxaca dresses for sale, Tehuana embroidered blouse, textile art. Bookmark the permalink. 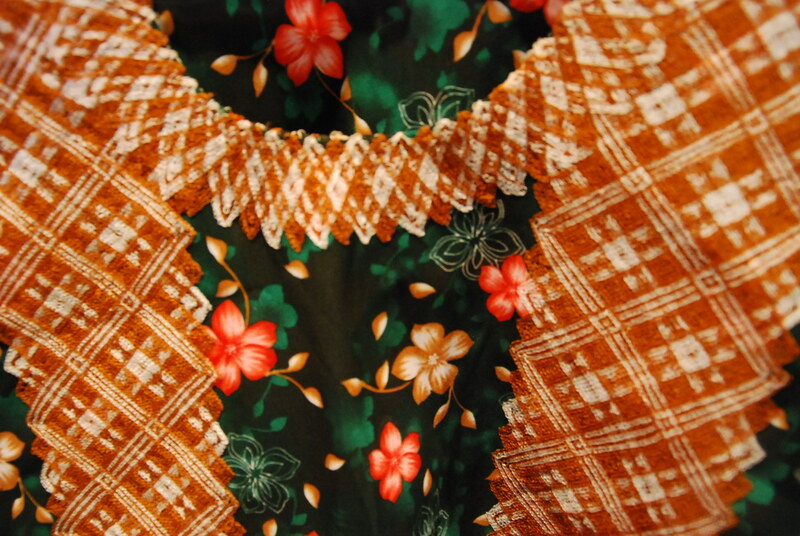 Been to Oaxaca a couple of times in past years so am familiar with the clotthing & aprons that come from there.